There are lots of metrics that could be collected to assess a software development team's competency, success, inventiveness, quality, and quantity of work. To get an idea of what metrics one could collect, take a look at the 185 practices in CMMI for Development. Agile, unlike CMMI, doesn't require "evidence" that engineering practices are being followed and therefore has few metrics that a Scrum Team may collect to measure the success of each sprint. 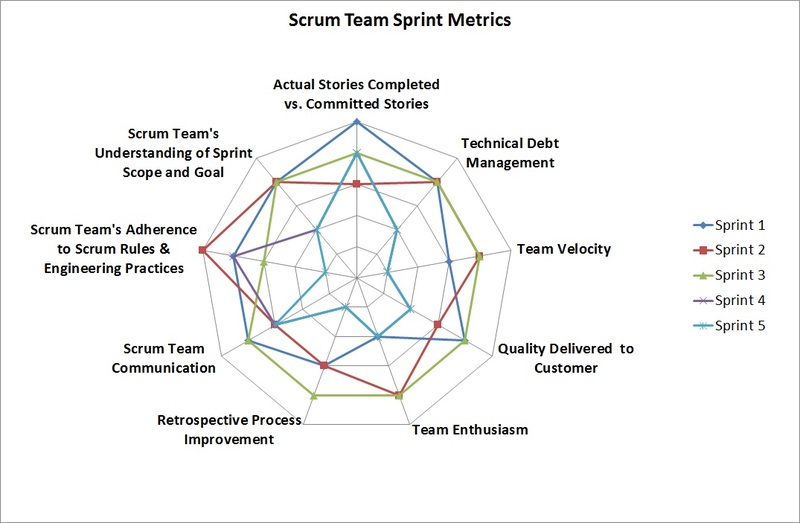 Below are 9 metrics that a Scrum Team might consider using. To answer the question of who should be collecting metrics and measuring the Scrum Team's success, consider who in Scrum is responsible for the team's success. In describing the role of ScrumMaster, the Scrum Guide states, "The ScrumMaster teaches the Scrum Team by coaching and by leading it to be more productive and produce higher quality products." Clearly it's the responsibility of the ScrumMaster to measure the success of the team if only to increase the team's productivity and product quality. The ScrumMaster could use a spider chart as shown below to track the Scrum Team. 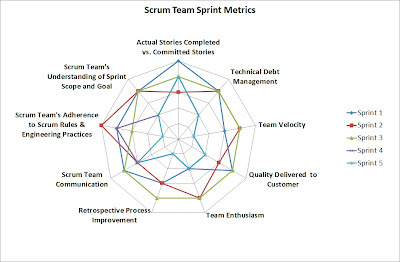 Using a spider chart is an easy way for the ScrumMaster to track and compare results from sprint to sprint. Below are short descriptions of each metric, how it can be measured, and some of the issues that could lead to a low score. Any additional metrics or comments on these 9 would be most welcomed. Team is being disrupted (see Scrum Team's Adherence to Scrum Rules & Engineering Practices, Team Enthusiasm). Story commitment is met but the product is 'buggy' (see Technical Debt Management, Quality Delivered to Customer). Team is creating bugs that reflect their opinion on how things should work rather than listening to the Customer (see Scrum Team's Adherence to Scrum Rules & Engineering Practices, Quality Delivered to Customer). Team is doing very short release cycles (< 3 sprints) or doing maintenance work (the Team might consider Kanban or XP over Scrum under these circumstances). Velocity is consistent but the product is 'buggy' (see Technical Debt Management, Quality Delivered to Customer). In most companies, delivering a quality product to the customer and keeping the customer happy is your only reason for being. Scrum attempts to have the outcome of every sprint provide value to the customer i.e. a 'potentially releasable piece of the product'. This is not necessarily a product that is released but a product that can be shown to the customers as a work in progress, to solicit the customers' comments, opinions, and suggestions i.e. are we building the product the customer needs. This can be best measured by surveying the customers and stakeholders. 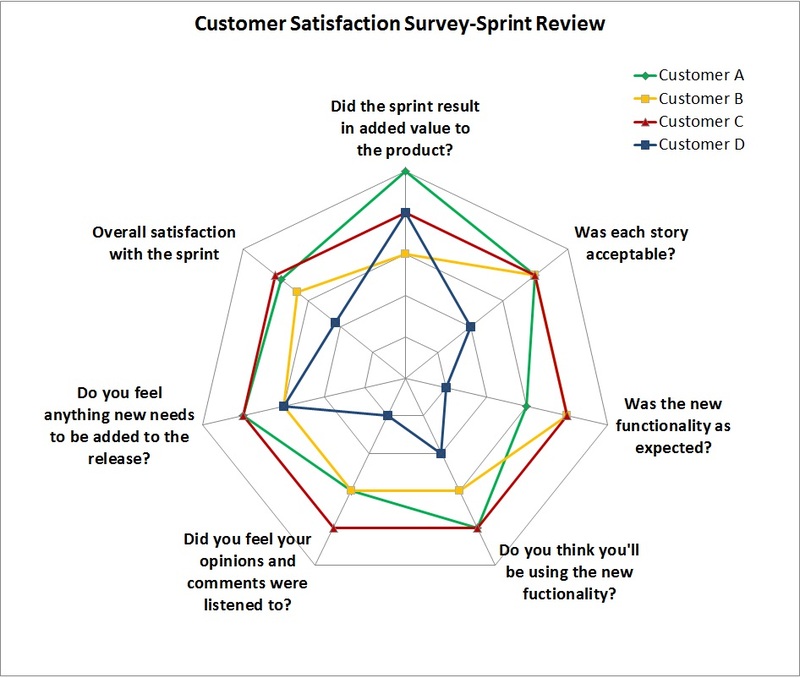 Below shows a spider chart survey of customers made after the Sprint Review. 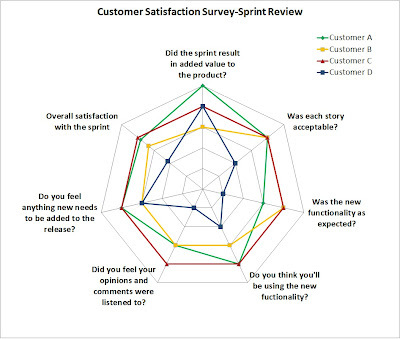 The ScrumMaster can document all customer or stakeholder opinions using an easy to read spider chart. Bugs are delivered with the product (see Technical Debt Management). Not all customers and stakeholders are invited, show up, or participate in the sprint review (see Scrum Team Adherence to Scrum Rules & Engineering Practices, Communication). The Team is not being creative or innovative. Team is not acknowledging or addressing repeated mistakes (see Team Enthusiasm). Scrum Team is not visibly displaying non-function requirements that apply to entire sprint or release (see Scrum Team's Adherence to Scrum Rules & Engineering Practices). ScrumMaster is not ensuring the sprint retrospective meeting is held. Team doesn't understand the scope of work at the start of the sprint (see Team Velocity, Communication). Just one question, how could you measure Actual Stories Completed vs. Committed Stories in a five unit scale? What does mean 3? in this case? How it goes the Team Velocity? What 5? Etc.. Anonymous asked: How could you measure Actual Stories Completed vs. Committed Stories in a five unit scale? The Actual Stories Completed vs. Committed Stories KPI can be used to measure the team’s understanding of their own capabilities. I assume that the measure is taken as a running average over some number of sprints; the number of sprints should be agreed upon by the entire Scrum Team. The scale used is arbitrary and is most likely selected based upon the scale used throughout your company or your personal preference. I chose a scale of 5 on the spider chart example because that’s what I’m used to seeing but any range can be used. Of course, if the team falls short or exceeds the committed number of stories at the end of a sprint, the team should discuss the reasons and recommend solutions at their retrospective. Well, the aim of the The Actual Stories Completed vs. Committed Stories KPI is clear for me. But how will be the metrics formulated? All the team members give an answer, formally a point between 1 to 5, where 1 is for the worst performance (actual stories completed <<< committed stories), and 5 is the maximum performance (actual stories completed > committed stories). Am I right? These are really useful set of metrics but would like to know how exactly you have measured the score for these specially Retrospection, Technical Debt , Team Enthusiasm etc . I am interested to know how have you quantified these KPIs. Please do share as I would want to use within my teams. The measures I would recommend for the Retrospective Process Improvement, Technical Debt Management, and Team Enthusiasm KPI's are listed below. These measures may or may not suit your specific circumstances but are general enough to give your teams some insights on how they're doing. • Count of improvement items identified in the Retrospective - 1 or more is expected. • Scrum Master provides their opinion of team's enthusiasm to improve itself (1-5). For example, the Development Team has decided to increase their automated acceptance test coverage of stories from 25% to 40% in the next sprint. If, by the end of the next sprint, the team is automating 35% then they would probably score 4 on the 1-5 scale. • Count of defects at the beginning and end of the sprint - there should not be more defects at the end of the sprint than were at the start. You would need to take into account any product backlog items specifically to reduce technical debt that are in the sprint. For example, the number of outstanding defects for the Development Team remains unchanged after the sprint would score 5 on a 1-5 scale. • Each Development Team member scores themselves on how much they're enjoying their work (1-5). Scrum Master surveys the Team in the retrospective. • Scrum Master provides his or her opinion of team enthusiasm through observations of the Development Team during the various sprint meetings; planning, review, retrospective, and daily stand-up (1-5). Thank you for all this info! it's really helpful to me. What tool(s) do you recommend to make metrics process gathering easier to get as well as to manage the whole scrum project? Well I am a project manager and have been going through the guide to Scrum Body of Knowledge by scrum master training provider Scrumstudy which provide a complete guide for the scrum project. I highly recommend this books to all those who are planning to implement scrum in your organization. You can go directly to http://www.SCRUMstudy.com for first chapter is available there. SCRUMstudy.com also offers agile scrum certification (Scrum Master Certification) trainings across USA. Visist www.scrumstudy.com for details. After thinking over for quite a while about whether to go for PMP or SCRUM certification, I opted for a PMP prep course , Instructer was too good and I passed with relative ease. Looking forwards to apply what I learned in PMP classes in my company. Personally I think tracking metrics is essential as it enables you to foresee possible issues so that you can take action proactively, rather than do firefighting later. The Information which you provided is very much useful for Agile Training Learners. Thank You for Sharing Valuable Information. Your post was very helpfull to me.